What awaits beyond the cemetery gates ...? Journey into the cemetery and beyond with author Minda Powers-Douglas and meet cemetery sextons, gravediggers, preservationists, writers, artists, authors, ghost hunters, the director of a funeral museum, a genealogist, and an assortment of taphophiles (people who love cemeteries). Discover what's really behind our attitudes toward death, graveyards and those resting inside them. Find out what is superstition and what's fact in this insightful and often funny guide into the world of cemeteries. You'll meet British horror author Simon Clark, "low-brow" artist Madame Talbot, genealogy author and lecturer Sharon DeBartolo Carmack, Jon Austin from the Museum of Funeral Customs, and New Orleans Voodoo Priestess Miriam, as well as many more intriguing individuals. Come explore the dark side ... it's not as scary as you think. You'll never look at a cemetery the same way again. A dove? An anchor? A book? A skull and crossbones? You can find these and many, many other symbols on tomb-stones, but what do they mean? Cemeteries are fascinating places places filled with history, art and meaning. The symbols carved on tombstones say a lot about the people who once lived and are now buried in our eternal parks. This book will explain the meanings behind the symbols and help you understand the special language of tombstones. Built on a ridge named for the great Native American spirit Manitou, Chippiannock Cemetery has honored the dead of Rock Island County for over 150 years. Chippiannock, which means "village of the dead" in the Sauk and Fox languages, is truly a village. People from all walks of life are buried in the majestic rolling grounds. From railroad and lumber barons to blacksmiths and riverboat captains, here one will find the people who made this land along the Mississippi River thrive. Upon stepping through the gates of Chippiannock, one finds memorials to the dead, ranging from artistic and stately to simple or humble. Each stone tells a story-whether it is a cenotaph in honor of Civil War major general John Buford or the two Dimick children who passed away on the same day in 1878 of diphtheria. 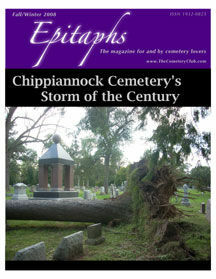 Today Chippiannock remains an active, "living" cemetery, beloved by locals and considered a jewel of the Quad Cities. 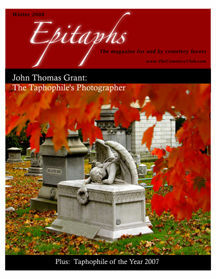 Epitaphs Magazine is the magazine for cemetery lovers by cemetery lovers. It is an independent publication that accepts submissions from around the world. For more information about EM, visit www.EpitaphsMagazine.com or www.TheCemeteryClub.com. Issue #6 features: - The Taphophile's Photographer: John Thomas Grant - The Taphophile of the Year 2007 - Crown Hill Cemetery in Indianapolis - A Brief History of Coffins - Photography from Kensal Green Cemetery in London - And more! 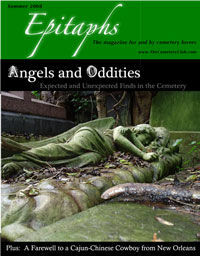 Epitaphs Magazine is the magazine for cemetery lovers by cemetery lovers. It is an independent publication that accepts submissions from around the world. For more information about EM, visit www.EpitaphsMagazine.com or www.TheCemeteryClub.com. Issue #5 features: - The Photography of Jeffrey Netz - An Interview with Brenda Sullivan of the Gravestone Girls - The Proper Way to Clean a Gravestone - How to Adopt a Cemetery - Greenlawn Cemetery in Columbus, Ohio - And more!